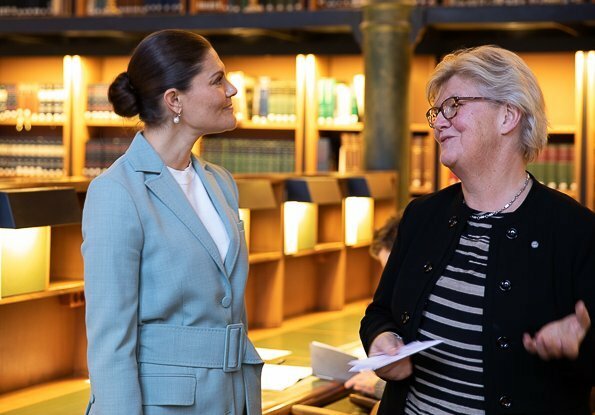 On November 21, 2018, Crown Princess Victoria visited The National Library of Sweden in Östermalm. 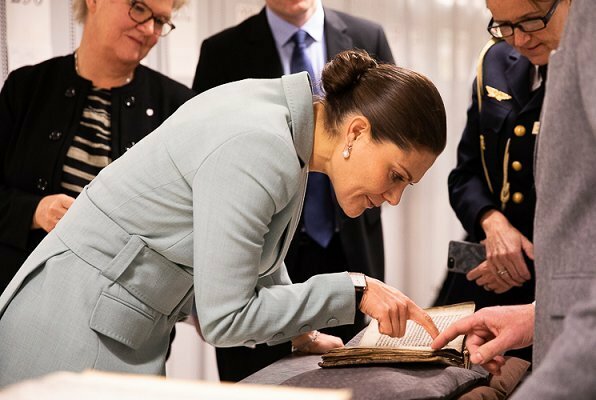 The National Library of Sweden has been collecting virtually everything printed in Sweden or in Swedish since 1661. The National Library is also a humanities research library that purchases scholarly literature in several languages. I like the jacket and wide belt, but not the wide pants. I think it all fits nicely together, the pants are still acceptable to me. Na ja, nicht wirklich schlecht, aber das kann sie besser. Insgesamt wirkt sie in diesem Hosenanzug etwas gedrungen. This might be the only time I’m saying this but the bun saves the look for her. Malgré tout je préfère la reine Maxima. It's ok. I like the colour and jacket, the trousers are a bit 70s housewife polyester slacks. Simple and understated. Victoria looks great,also nice color. Just not flattering. Period. Looks too big. Like she has someone else’s clothes on. She has a great figure. You can’t see it in this suit. I really want to like this outfit - but I can't. nothing works for me - the fit, the colour, the way the fabric drapes on the pants, the super wide belt... I want to see something I like.... (not even the bun - for me, although it is possible that without it I would have liked it even less). I quite like this suit. It fits her well, I think, and the defined waist creates a nice silhouette. 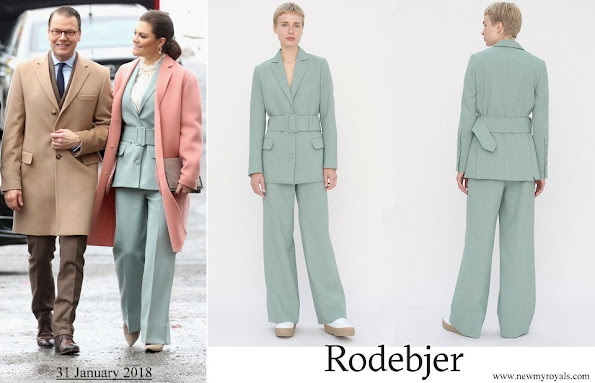 Also I think the trousers don´t look too wide thanks to the pleats she added. Good call, makes for a look that´s both structured and polished. Victoria looks so much better in fitted clothing. She gets lost in this outfit. Yes true, however she cannot always wear fitted clothing. Some clothing pieces are by nature intended to be more confortable, and I think she likes adopting different styles. Looking at the model she gives the same impression of cosyness, not a reason to reject it.